The all new Contra is a featherweight cannon that delivers light wind fun like you’ve never had before. It has the muscle to get you up and riding when the winds are barely showing signs on the water. The ultra efficient profiles optimize the low end power production while allowing excellent depower on the top end.Maximizing performance in light winds the 3 micro struts improve aerodynamic performance using light weight materials with very low drag. 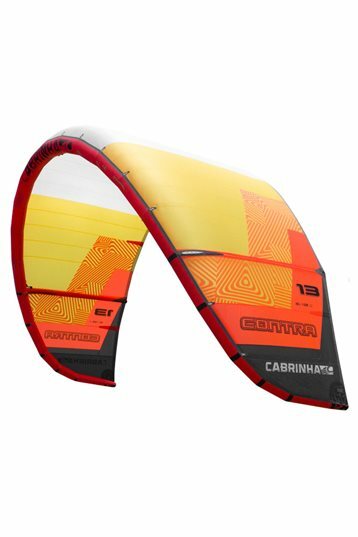 The Contra delivers distinctly sharp and precise turning that makes generating power and speed a snap while maintaining the agility of a smaller kite. The Overdrive 49-57 cm bar should not be used with the Contra kites due to the length of the security line. The Contra must use the Overdrive 1XL to achieve the full function of the security system. With the Cabrinha Contra in your hands you immediately sense the drag. Its profile and a thick leading edge give the Contra a feeling of stability & constant power at the edge of the wind window. You could say, park & go under the 10 knots! If the wind picks up, the Contra loses its performance. Longer depower stroke, lots of bar pressure and less upwind ability. The gliding phase gets more interesting above 12 knots, so for tall & heavy riders this kite could still be a good option. Best use? 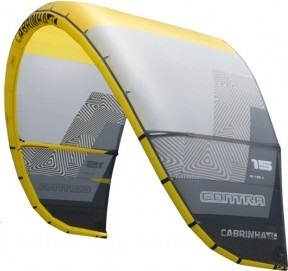 Use the Cabrinha Contra in its low end as a Park & ride kite. We tested the Contra mainly in its low end area on a north Nugget and a 138-40 twin tip. The Contra was the first kite to get me plaining, but also the last to get me upwind. Its position is very deep in the wind window, which provides a lot of pressure in low wind but also prevents you from riding upwind once you're plaining. Compared to other 17m2 (north, blade, core) its reaction is quite slow. Resume: a stable and early plainer for those who wants to cruise up and down. Easy to feel and it won't surprise you. Do not expect too much high-end performance, its a really low end early plainer. 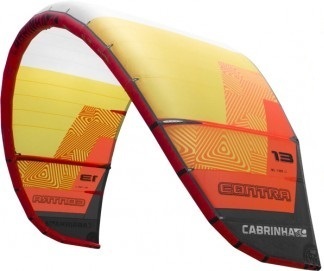 We tested 5 LW kites and around 8 knots the Cabrinha Contra was one of the first kites to plain with a twintip. The Cabrinha Contra builds up an enormous pressure on the edge of the wind window. The Contra wasn't the fastest reactor and has a bigger turning circle than others. The changing angle of attack while powering or de-powering is very clean and efficient. That makes the Contra stable and very predictable. No crazy boosts, no loss of bar pressure or feedback while steering. No, this Contra is an easy & predictable LW kite. Use it to be one of the first riders on the water.